Don’t miss all our free Christmas ideas for children’s ministry. We also have another full length lesson plan on this same passage if you need more teaching inspiration. Ask if anyone has ever been promised something that they had to wait awhile to receive. Maybe it was a gift of some kind, a special trip, etc. Ask what was difficult about waiting? How did they feel when they finally received what had been promised. Was the gift, trip, etc. worth waiting for? Say that God made a promise to send Jesus long before he was born, and today we’ll hear prophecies that were made hundreds of years before His birth. God’s people waited a long time for the promised Messiah to arrive. Pray that God would open our hearts to His Word today and that He would draw us closer to Him through Christ. Ask: Does anyone know what it means to make a prediction? Say: Did you know that there are predictions in the Bible? They’re called prophecies, and they tell about things that will happen in the future. Say: Today we’re going to learn about a very important prophecy in the Bible that tells us something special about Jesus. We’ll also hear how that same prophecy came true and that Jesus is God’s promised Son. That’s our main point for today so let’s learn the hand motions together. Main Point: Jesus is God’s promised Son. Say: Isaiah was a prophet of God. That meant that God spoke to Isaiah and Isaiah wrote down the things God said so he could share them with all of God’s people. One day God spoke to Isaiah about something really special that God was going to do. You see, the world was broken because of sin, and God’s chosen people had stopped believing and trusting Him. But God had a plan to rescue His people and bring them close to Him again. This was the special plan that He told Isaiah about, and Isaiah wrote it all down. Say: I’m going to read a few verses from Isaiah’s prophecy and as I do listen for the different things that he said about God’s Son. Say: God told Isaiah that He would send His Own Son to live among the people on earth. His name would be Immanuel, which means, “God is with us.” He would be a great king, but not like the kings anyone had ever known before. He wouldn’t live in a fancy palace and have lots of money. No, this king would be poor. In fact, he would be a servant. That might not sound much like a king to you and me, but God promised that His Son would rule as king forever! God also said that His Son would come to earth as a little baby. That sounds crazy right? God planned to rescue the whole world and He would do it with a helpless little baby? It might sound strange, but that’s exactly what God promised. Say: That reminds me of our main point. Let’s practice it again together. Say: Later on in God’s Word, in the New Testament, we read how all these promises of God came true. 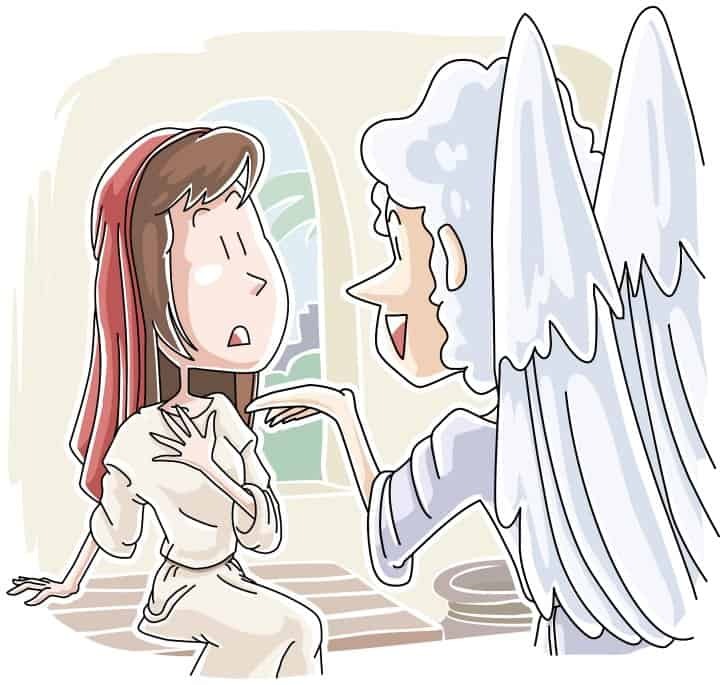 This time God sent an angel named Gabriel to speak to a young girl named Mary. Mary was engaged to a man named Joseph, but they weren’t married yet. The angel Gabriel appeared to her and he must have been really big and bright because Mary felt frightened. Gabriel told her to not be afraid and that God was very happy with her. Gabriel told her that she was going to have a baby boy and she would name him Jesus. Jesus would be God’s Own Son that He had promised years and years ago. This little baby boy would grow up to rescue the world and bring everyone close to God again. He would beat sin and death and help people to believe and trust God again. Say: At first Mary was surprised. She wasn’t even married yet. How could she have a baby? But Gabriel said that nothing is too big or too difficult for God. Mary trusted that God would do what He had promised. Say: That’s right! Gabriel said that Jesus would be God’s own Son and that he would reign as king forever, just like Isaiah had written about! Who remembers our main point? Let’s say it again together. Ask: Isaiah and Gabriel got to announce some really good news didn’t they? It’s good news for us that Jesus came to earth because we’re people that he came to save too! God wants to rescue all people, including you and me, from our sin. He wants us to be close to Him and know Him and love Him. When we know Jesus we can know God. That’s why Jesus came to earth in the first place. He wants us to let him beat the sin in our hearts so we can be close to God again. Say: Do you like sharing good news? Of course you do! Everyone loves to tell people about good things that happen to them. Well, the news of Jesus’ birth and life on earth is news that you can share too. You probably know someone (or lots of people) who aren’t close to God. Because we have the good news about Jesus that means we can share it with others so they can know and love God too. Pray …. Dear God, thank you for your Word and for sending Your Son Jesus to earth to live a perfect life and die for our sins so that we could be close to you again. Help us to share this good news with people that we love who don’t know you yet! Amen. What was the announcement that Isaiah made in the Old Testament? Who did God send to announce Jesus’ birth to Mary? Why is the news of Jesus coming to earth good news for us? Say: When someone is about to have a baby there is a lot they need to do to prepare. They have to make sure they have a bed ready for the baby, blankets, diapers, a car seat, etc. When the angel came to Mary he was telling her about a very special baby that she would have. He would be the very Son of God! Mary was probably nervous and scared about the angel’s announcement. Have one child read Mary’s response to Gabriel in Luke 1:34-38. Ask: Has God ever asked you to do something that felt impossible? What was your attitude about it? Ask the kids to think about a time that they felt overwhelmed by something God has asked them to do. Give them a few minutes to write about or draw a picture of that time. Give them time to share with the rest of the class if they would like. Prior to class starting create a pathway around the room using masking tape. Have the kids pair up with a friend. One kid will be blindfolded and the other will have to guide them along the tape pathway using only their voice. Allow time for each child to be blindfolded. Come back together as a class and ASK what was difficult about this game. Was it easier to be the blindfolded partner or the one giving instructions? Say that sometimes following God feels like walking with a blindfold on, but we can trust that God has a good plan for our lives, even when we go through difficult times. It was probably hard for Mary to trust God at times, but He never left her and He blessed her abundantly! I love this class. It included very important points very easy for the kids to understand. Thank you for your help. Thank you very much Pastor. God has answered my prayer, we have been looking for bible lessons for our children ministry. May the Lord bless you in all your ways. Most of the information on the internet is not for free, but you have given us expensive information for free. I pray that you may be richly blessed, may God grant all the desires of your heart. Tony Kummer (Editor) reviewed & updated this page on : December 4, 2015 at 8:56 pm. All our content is peer reviewed by our readers, simply leave a comment on any post suggest an update.